Our 5th annual Hop-Fest Starts this Friday at 11am and goes until the Beer runs out. Here’s the line-up. Author Brouwer's CafePosted on August 26, 2009 April 28, 2016 Categories Uncategorized5 Comments on Hop-Fest! In 2009, on Friday August 21st, Vinnie will take the long trek up to Seattle, where he will host a brewers night at Brouwer’s Cafe. He will be on hand to discuss, and drink his award winning brews. Russian River beers on tap for the night will be: Blind Pig, Consecration, Damnation, Deviation,Pliny the Elder, Publication, and Temptation. The fun starts around 6pm. Temptation: “Aged in French oak wine barrels for twelve months with distinct characteristics of fruit and subtle oak” sounds more like a description of wine than beer. However, Temptation is indeed beer. Temptation is a Blonde Ale aged in French oak chardonnay barrels with Brettanomyces. Flavors of wine and oak absorb into the brew throughout its aging. Temptation is re-fermented in the bottle to create its carbonation–a process commonly used to make fine champagne and sparkling wine. Spent yeast forms a thin layer of sediment to remain in the bottle. Russian River Publication is here! Russian River’s Publication has finally landed! Here is what brewer Vinnie Cilurzo had to say about it. Tasting Notes: Golden in color, strong yeast aroma with mild aromas of barnyard and leather from the Brettanomyces. Flavor’s of malt and spice dominate the palate with a dry nutty (malt) character mixed with a funky Brettanomyces finish. The hops are dominate but well placed with-in the brew. Publication started out as a test beer we called Empirical 7 which was a blonde ale fermented with a Saison yeast I wanted to test out for the PNC beer. 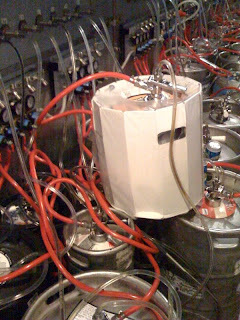 The Empirical 7 was extremely hoppy and very very dry and the use of Brett for keg conditioning was very heavy handed. The Empirical 7 was meant to be a test batch for the members of the PNC to taste and based on their feedback I would build the recipe for the first ever PNC beer. At about midnight the night before the brew, over a game of Washoe’s and 10 beers into the night we finally got around to talking about the beer. 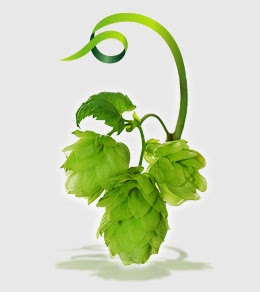 A higher ABV was requested with more characteristics from the yeast and fermentation were also wanted in the PNC beer. With that in mind I set out to tweak the test batch and brew the next day. In the end I did bump up the malt bill so we could reach an ABV of 8%. I also switched out some of the base 2-row malt for some pilsner malt which would add another dimension with the malt characteristic in the beer. We used the same hop bill as the test batch so with a higher ABV and more malt on the palate the hops would be a little less aggressive. In fermentation we fermented about 6 degrees warmer to get more yeast characteristic in the final beer. Once the beer was ready to keg we used a smaller amount of Brett so there would be more flavor from the fermentation coming through. At a young age, this beer drinks very well, but, there are still some rough edges which will round out nicely as the beer ages. We have a secret tap tonight for those of you in the know – Russian River Consecration. Ask for the secret tap! Happy Hour at Brouwer’s Cafe now goes from 3pm to 7pm, 7 days a week. Happy Hour consists of $1 of all drafts and well drinks, and some great specials on food like Buffaloar Sliders (Wild Boar and buffalo mini burgers). With a $1 off on our drafts you can get many domestic schooners for as little as $2! The revolutionary one-way KeyKeg®, suitable for any liquid and especially carbonated drinks, is developed according to the bag-in-ball concept. This lightweight disposable keg has been developed specially for beers and offers you extra protection, longer preservation, more sales and a clear reduction of costs. The KeyKeg® is available in a 20 and 30 litre version and weighs only 1.0 and 1.4 kg respectively. The extreme low weight results in up to 25% more beer, wine or cider per transport and voluminous transport of empty kegs back is no longer necessary. If these kegs work as well as they say you can expect to see more imports arriving in these. This particular keg is of the Tilburg Dutch Brown Ale, brewed by Koningshoeven. Tuesday, July 21st, we will be tapping a Firkin of Schooner Exact’s 3-Grid IPA that has been Dry Hopping for nearly 6 months! Come join Matt, Marcus, and Heather for a pint! An extension of Quercus Alba —the Firestone Walker Barrel aged program. Just wanted to let everyone know that as usual we will be closed on the 4th of July. To fulfill your fine beer needs make sure you go to Bottleworks, which will be open, for a pint, a growler, some bottles, or even a keg for that 4th of july party. Alright, I’m back in town and I’m ready to get everything here hammered out to keep this draft list updated on a daily basis. While a flash website is nice and pretty, it’s just been such a hassle for us to update as frequently as we should be. So we’ve switched over to this blog format. We’ll clean it up and make it look prettier as time goes on. The important thing though is that we got the Draftlist on here now, and it is up to date, at least for now. My next step is making it so people other than myself can update it on a daily basis. Alas I’ll be out of town until next week and that will be the next update. Sorry, it’s still a work in progress. Last week was a bit crazy…. What a crazy week last week was. Monday started off witha bang, Big Time rolled out the Old Wooly Barleywine. Wednesday Big Time cleared the cellar. On Thursday the opening day of the Big Wood festival I was found out that I was capable of doing something I would never would have suspected. Let’s just call it my little circus trick. Matt Bonney wondered aloud if I could balance a snifter on my bald head, so we tried an empty one it worked, I walked up and down the length of the bar, then we had to fill it and guess what? I was able to do it again, my reward, I got to drink the contents, Stella Artois, not too much of a reward in my opinion….to bad I wasn’t a bit more ambitious. Lucky for me a regular was there to capture the moment, ah the joys of modern technology such as Iphones…. Big Wood was a success thanks to all who attended. 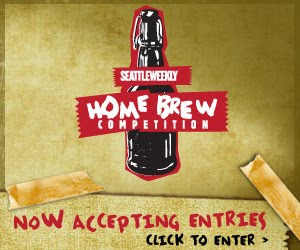 The winners were, for the second year in a row Flyer’s Bottleworks VII won, second was Lost Abbey’s Brouwers Blend, and third was Port Townsend’s Marker’s Mark Porter. Honorable Mentions were Big Time Dancefloor, Lost Abbey’s Angel’s Share and Dogfish Head Palo Santo. Thanks again to all who were in attendance and made this a success. Stay tuned for more circus tricks, although I am unsure how I will out due this one. I was accused of having model posture so I may be headed of to and Agency real soon.